Hadahur Music School, Launch in President's Palace etc » Tekee Media Inc.
Hadahur The music school established in East Timor by Mary Mckillop East Timor Mission in conjunction with Tekee Media Inc, was formally opened by the President of Timor Leste, His Excellency Dr Jose Ramos Horta, at a concert in the President’s Palace on Saturday the 18th July. 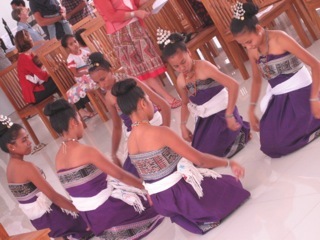 Performers were made up of students and staff from the school, Timorese and Internationals. Performances were given on piano, voice, classical guitar, violin and a variety of ensemble pieces. The students of these instruments commenced studying them via web cam in the past few months, in the case of the classical guitarist only with 2 lessons to date! The long term vision is that these students will be taught and mentored via skype and they will start to teach students when they feel confident enough to start, with the International teachers backing them up from afar. The first violin and guitar students of these teachers commenced lessons this July! Aurelio Ximenes having a web cam lesson. 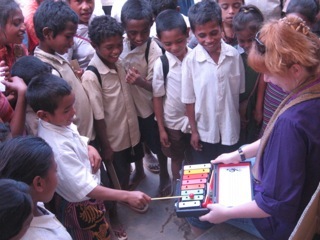 This trip a program of music education was introduced to a remote mountain school, Bessilau. 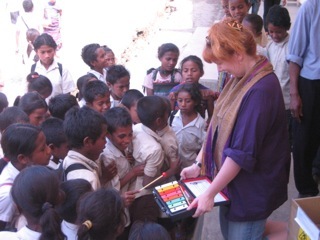 Australian music educator is Rachel Scott renowned for introducing similar programs in Australia in remote communities. 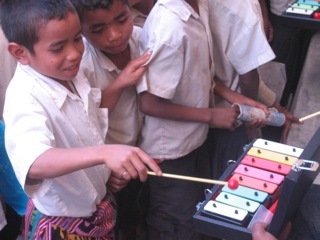 It was felt that a similar method could be used to introduce music to schools in Timor Leste. When Rachel approached Hadahur with the idea of training teachers with no musical background to deliver music programs in schools we thought …well why not! 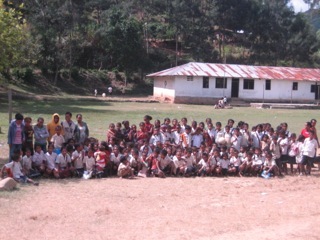 What was started was a huge success beyond any of our expectations, the staff and students at Bessilau school embraced the program so wholeheartedly and enthusiastically On the day Rachel arrived at Bessilau (after only 3 hours in Timor Leste and a road trip of astonishing beauty, views and daily life so typical in Timor), the whole school had assembled to greet her in true Timorese fashion to walk a corridor between two lines of children singing and a presentation of tais. By the time she had completed the week the same children and staff were sad to see her go! The principal of the school wholeheartedly embraced the program to the extent that he took part in every class enjoying himself as much as any child! We are confident that as each stage is introduced to the school over the next few years it will be hugely successful and become part of the daily curriculum! This program has been made possible by a grant awarded to Hadahur by the ISME (International Society of Music Education) and Gibson Guitar in their Community music award, which Hadahur has been awarded for 2009. (please see Rachel’s report on her week’s work at the end of this blog). The above photos taken on the day the instruments were unpacked at the school. 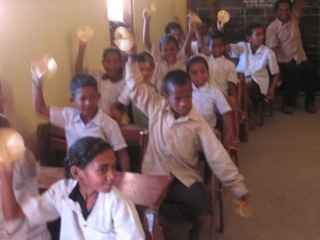 some photos from the classes, there were lots of smiles & laughter & noise!!! Traditional Musicians came from Cova Lima (Suai Loro) and Maubisse and Liquica giving wonderful performances of the traditional music of those districts, many people in the audience had not seen traditional music being performed before, certainly not of the calibre presented in this concert. The traditional music co-ordinator, Manuel Pereira performed and organised the musicians of Maubesse, and Liquica, Manuel was the first musician whose music I recorded as part of the Traditional Music Project, a consummate musician and he co-ordinated a spectacular performance. The Dancers from Suai Loro and a guitarist (playing on hand made guitar, somewhat larger than commercially made ones) and violinist accompanied them. These performers had an added surprise, as the Director of School Spectacular NSW was present at the concert, and there specifically to see these performers in action so that he could invite them to School Spectacular…either this November or November 2010. Manuel Pereira, Student playing the lakadou. This concert was the fruition of 15 months since we first commenced lessons. 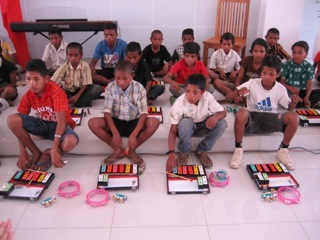 Teaching of students began last year out of two rooms at the back of the Motael Church generously lent to the music school by Father Alves. 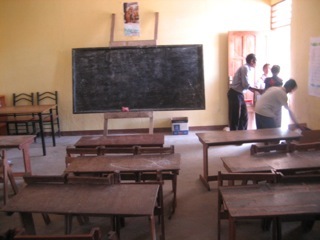 In May this year Hadahur had to find other places for lessons, moving equipment to a temporary facility in Lahane,. 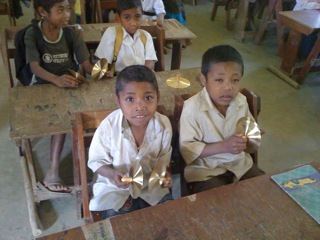 Although the school is launched, it is operating in several locations around Dili until much hoped for land is secured, hopefully we can give news of this before too long. 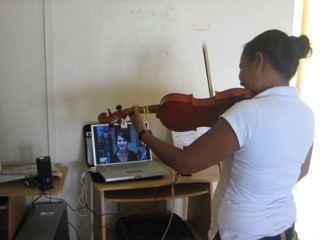 The location for web cam lessons is a room in Centro Juvenile in Taibesse so students can have regular web cam lessons in voice, violin, piano and guitar! 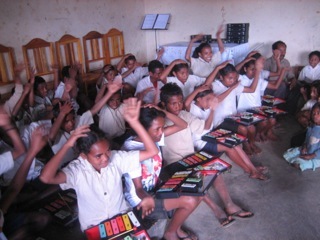 These lessons are given by professional teachers in Australia, some of whom went to Timor this July to work with students (Wendy Dixon – Voice, Ella Bennetts – violin, Ros Dunlop keyboard/clarinet). 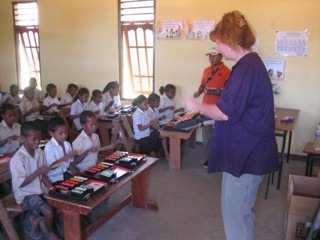 Four school concerts were given, with the above musicians and Rachel Scott (who was conducting the classroom music program and brought her bright purple cello to Timor….t’was a hit, both the cello and the concerts! A shame there was no time for more! 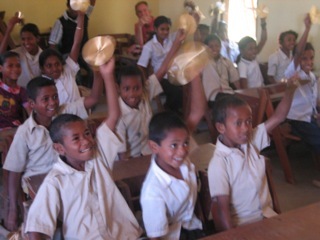 School children, indeed Timorese had not seen the like of such concerts before! As a team these musicians worked together very well, very hard, a lot of convivial times were had and personalities were well matched! 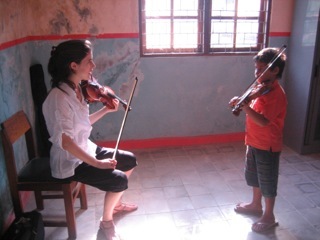 Ella Bennetts (violin teacher), giving a little boy his first lesson. 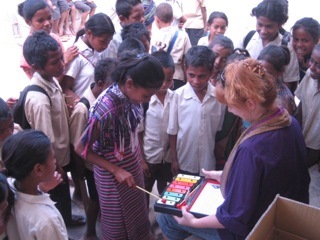 Wendy Dixon meeting some of her voice students after months of lessons on web cam. There were two soirees leading up to the concert in the President’s palace and an impromptu concert two days after the Saturday night concert in a bar/restaurant “Motion” who are known more for their rock concerts, we figured maybe a dozen people might come….the place was packed! The music school, the kind of music making and concerts it gives is timely! There will be more regular events at Motion given by the students of Hadahur. At all concerts, audience members were astonished at the standard of the talent and hard work achieved by students who have had so little tuition. Feedback from the concert has followed those of us travelling back to Australia all the way home! 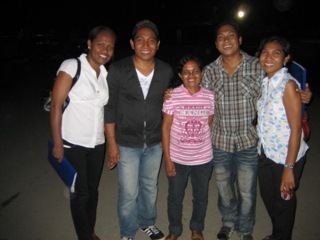 Singers from the acapella group Ko Le Le Mai, who performed in every concert. 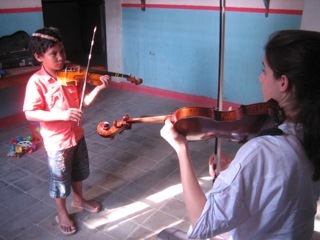 Milka Pinheiro has been learning violin, mostly on skype for a year now, and played confidently and musically with her teacher Ella Bennetts and the Director of the Music School Antonio de Padua. Milka has just commenced teacher 4 young children violin under the supervision of her teacher Ella Bennetts. 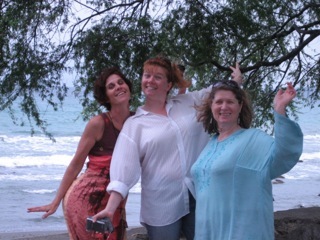 The singers who had all been working with Australian vocalist Wendy Dixon all gave solo performances and with a few others have formed an accapella group, delighting all who attended concerts with arrangements of traditional songs. 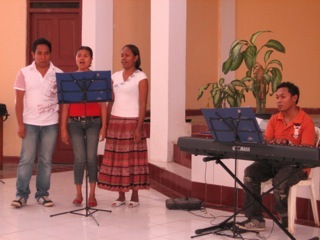 Mica, Sesca , Milka and Jacob all gave solo performances in various concerts. Antonio de Padua accompanying the singers, Jacob, Sesca & Mica. The Dili audiences were amazed and delighted to learn that there is a classical guitarist in town, Aurelio Ximenes who has only ever had two lessons (via web cam), is largely self taught and passionate about playing. Initially very nervous in the first of the mini concerts he became more at ease as he performed, he proved to be a focused and sensitive performer. Aurelio will commence teaching two young guitarists the classical guitar this week. As his confidence in teaching increases he will teach other students. Antonio de Padua, the Director of the music school and pianist displayed his love of Chopin in concert, but during these intense days of workshops and face to face lessons, …some conducted from the hall opposite the church in Becora….even for a while the walls of the lovely old Hotel Turismo were bursting with musical activity from a number of rooms, Antonio discovered he loved playing chamber music, so many chamber pieces (for clarinet, violin, purple cello and piano were added to the programs). 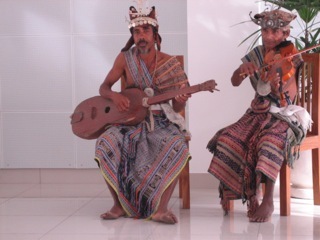 We have discovered there are Malae (foreigners) in Dili who also play instruments to a reasonable level who are keen to play ensemble music, so, in the interim periods when there are no international teachers coming to Dili there will still be possibilities for chamber performances. 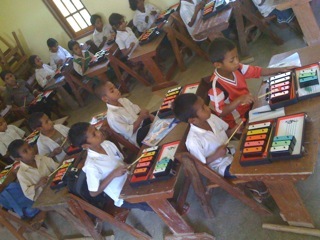 It is hoped that now that more prescriptive lessons have been planned for the early childhood classes that the Early Childhood teachers will be ready to open the doors for young children for music classes in January 2010. 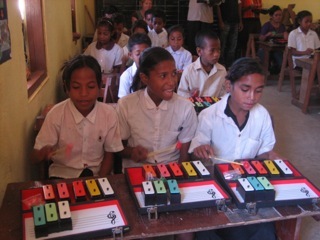 At present the music school is concentrating its efforts and resources on educating and increasing the level of performance and skill of those Timorese who will be the teachers of the music school Hadahur. We envisage that the school will expand enrolments in 2010. 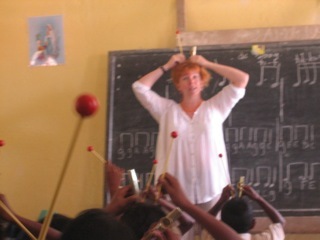 Early Childhood music class training teachers. ……The music programme is Bessilau was a huge success. 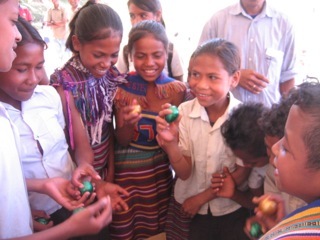 Of course the children loved every minute – and why wouldn’t they? But there were a few other interesting things that happened at the school as well. The teachers all joined in – and had as good a time as the children. A good example was the head teacher at the school. In the first lesson, he walked in, told children off, and prowled up the back. Within ten minutes, he was joining in, with a huge smile on his face. On day two, he was actively helping the children who were struggling. 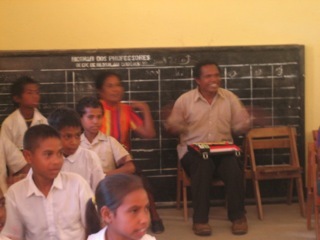 By day four, he was up the front, almost co-teaching with me – still with a huge smile on his face. By the teacher training day, he was the one checking that teachers knew what to do, and had driven around the district, picking up teachers who had gone home already. He is now a huge supporter of the programme. The teachers are incredibly excited – and extremely grateful. 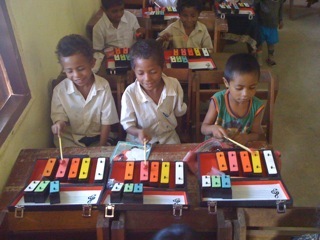 They have agreed to teach the children as best as they can, and to also arrange performances for other schools. We have proved that music surpasses all language barriers, and cultural barriers – and I see this programme as simply growing from success to success.